Or maybe not. Vegans and animal rights activists are likely to be horrified by the factory farming conditions depicted when the Chicken Man is doing his count, and even the lovers of poultry products among us may have a queasy moment or two. Certainly Bill’s “final solution” is horrifying on its face, although played for pitch-black humor. From the beginning, though, this is quite literally a “don’t count your chickens” scenario tailor-made (though not Taylor-made) to knock Dollar Bill’s confidence down a peg or two. That confidence is on full display when Bill opens his pitch by channeling the Boss before getting around to those magic words: “I am not uncertain.” Somehow or another (and maybe I don’t really want to know how), Bill has gotten intel from a meal delivery driver in Arkansas that the local chicken counter is too sedentary to do his job most of the time. Instead, he calls around to the chicken farms to get the count from people with a financial interest in claiming it’s low. Axe agrees to the play, but forces beyond Bill’s control throw a monkey wrench in the works. The chicken report is late, and when Bill goes down to Arkansas to investigate, he finds the Chicken Man dead in his home. What follows is Bill’s toxic need to always be right in Axe’s eyes cranked up to its absurd extreme. Once a team of suits is dispatched to make sure the count is correct, Bill will go to any lengths to ensure it’s still low. He kidnaps a sick chicken from quarantine with which he plans to launch a fowl genocide, but somehow Axe and Wags materialize in Arkansas just in time to talk him down. (That fast-travel Game Of Thrones introduced last season must be contagious.) Reluctant as he is to admit it, Axe has his limits, and unleashing a plague is across the line for him, especially following the Ice Juice debacle. Being wrong is unacceptable in his world, but even Axe recognizes that it does happen once in a while. Given his reckless behavior in going after Taylor, that might be a good lesson to internalize. That quest for vengeance has Axe stepping up his surveillance operation by having Hall install special “see through protective glass” cameras outside Taylor’s office. As it happens, Taylor’s father is in town for a visit and they’re working together on a new algorithm on a white board in full view of prying eyes. Kevin Pollak is well-cast as Douglas Mason, who has passed down his gift with numbers but is still struggling to relate to the offspring he still thinks of as “my little girl” on their own terms. It’s a more nuanced relationship than the initial set-up suggests, although it’s not clear whether Douglas is in on Taylor’s plan to send a signal to Axe via the whiteboard calculation: they want a truce, because continuing the feud is illogical. On the surface Axe agrees to their offer, but no one really believes he’s going to let it drop so easily. Over on Chuck’s side of town, his quest for higher office continues to be hindered by Connerty, with an assist from Sacker. Senior has set up an opportunity for Chuck to gladhand at the newly opened upstate casino, but an old case comes back to haunt the former state’s attorney: a whistleblower who Chuck dumped when it became expedient to do so. Chuck enlists Lonnie to his cause, in keeping with the show’s overall philosophy that no relationship is ever truly burned if both parties still stand to benefit from it. Chuck loses this round, but manages to salvage his meet-and-greet by hiding elastic bands under his pants and snapping himself with them to get the ol’ juices flowing. Wendy is still trying to get a more mutually satisfying sexual relationship going, but Chuck’s arousal template remains intact. In the final minutes, the alliance we’ve been teased with for many episodes now is solidified. Chuck secures Axe’s help in exchange for a promise that Axe won’t be a target if and when Chuck attains higher office. 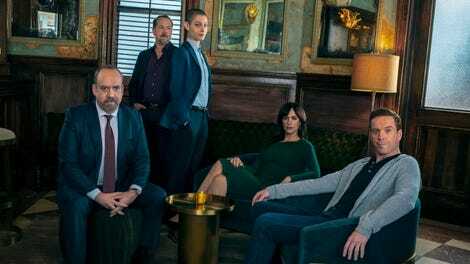 As always on Billions, this mutually beneficial relationship will last exactly as long as it serves both parties. It should be as much fun to watch it play out as it will be to watch it fall apart. The episode includes not only Bruce Springsteen’s “Atlantic City” (with its classic opening line “Well, they blew up the Chicken Man in Philly last night”) and Dollar Bill’s performance of same, but Daniel Romano’s “Chicken Bill.” What it doesn’t include is John Cooper Clarke’s “Evidently Chickentown,” probably because The Sopranos already used it in memorable fashion. Instead we get Wags and his corny “Forget it, Bill. It’s Chickentown” to justify the title. Anyone else suspect Michael Bolton wasn’t necessarily the first choice for the casino opening? That felt like a rewritten Billy Joel scene to me.